Freezers are used for protecting and preserving various food products and materials safe and healthy. In the traditional days, these freezers were modeled as a smaller region or portion within the refrigerators. But now the freezers are designed as separate devices such as upright freezers, chest freezers etc. 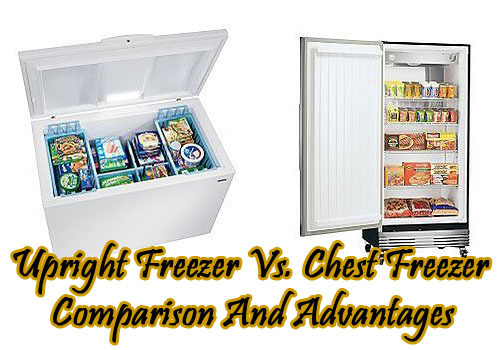 it is important to know the difference and comparison of upright freezer vs. chest freezer. Both the upright freezers and chest freezers perform the functions of the freezer and they can be used in various places with their design. Both these freezers can be used in conventional refrigerators. The differences and comparison between these two freezers are given below. The upright freezer and the chest freezers have various advanced features with various advancements and uses. As they perform a similar operation, they have many similar and different features with them. Various features and advantages of these two devices are given below. Before moving to efficiency and performance, the important feature of the device to be discussed is the storage area. Mostly all the upright freezers have very less storage area but the chest freezers occupy high storage area compared to upright freezer. The minimum storage area of upright freezers is 1.0 cubic feet and the minimum storage area for chest freezers are 3.0 cubic feet. The ground storage area of the upright freezers is very low, but the height of these freezers is high. Consequently, the chest freezers have a high ground surface area but less height. Capacity is also an important feature that is used for determining the performance of the device. If both the upright and chest freezers have the same dimension, then the volume of the device will be same, but the capacity of the device will differ. This is because upright freezers have front openings and overloading may cause damage to the products. Further, the overloading may also result in improper conditioning and arrangements of the system. The chest freezers have top openings and various types and varieties of food products can be dumped into the entire system easily. Hence, the capacity of the device is high and so this device can be used for storing the food materials and various products for many days. The materials and things within the upright freezer can be viewed easily because they are arranged in order within the rows of the device. But, in chest freezers, the lower products cannot be viewed easily because these devices are covered by the top layers materials. In addition to this, the accessing mechanism in upright freezers is easy compared to chest freezers. In upright freezers, the products can be accessed easily without removing or by removing little products. But in chest freezers, the top layered products should be removed for accessing lower layered products. Mostly all the chest freezers have the use of wire baskets with them and these baskets are used for storing small thing with them. But the upright freezers lack this wire basket feature. In upright freezers, various rows are seen and these rows are equipped with wired trays so that the things can be easily arranged in an orderly pattern within these trays. Chest freezers lack this feature. 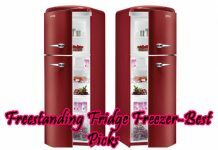 As both the devices are freezers, the efficiency of the device varies and it depends on the brands of the freezers. In general, the efficiency of chest freezers is high compared to upright freezers because they can freeze various food products and things at same time. 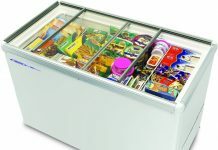 The upright freezer’s efficiency is nearly similar to that of chest freezers. Similar to efficiency, the performance of the chest freezers are high because they keep the food fresh and healthy for more than 3 months whereas the upright freezers keep the food fresh only for few days only. Both these freezers have similar advantages. 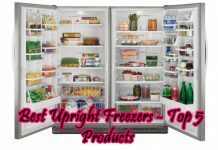 The upright freezers can be used for storing various liquid drinks and foods effectively. These freezers are used in recreational places and in some houses. The chest freezers can be used in the market, shopping places, within houses etc, and this device can even be used for storing ice creams and dairy products. Apart from foods, this freezer is also used for keeping various medicines and other products for a long time. From the above paragraphs, it is clear that the chest freezer is an advantageous freezer compared to the upright freezer. So, choose the best chest freezer for various purposes and enjoy fresh and healthy food always. Hope this article is useful to you; if you have any queries comment it in the box given below. Is There a Difference Between a Chest Freezer and a Deep Freezer?